"A program that allows you to run your Android apps on your computer"
Have you got an Android device and wish that you could run your apps from your computer? If so, then BlueStacks will help you out. 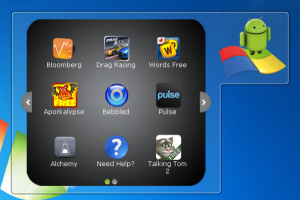 This program allows you to run yours Android apps from your Windows computer, be it a laptop, a tablet or a desktop. It looks and works like a gadget from Windows 7. To start an application, you simply click on the icon and it will show you a list of apps. Currently, there only are 10 pre-determined programs and most of them are games. You can install more apps by clicking the [Get more apps] button. At the moment, there are over 26 apps that are compatible with the program. BlueStacks was released in October 2011 and has been downloaded over 500,000 times. It uses a new virtualization technology, that allows the apps to run on full screen. It took 10 engineers 2 years to create this technology.